The logic behind BF Scalper EA is very simple but effective - the EA uses breakouts of the Bollinger Bands for entry and exit signals. TicksTrade - if "false", the logic will be executed at the beginning of M1 bar, otherwise it will calculate and trade on a new price tick. StealthMode true/false - conceal stop loss and take profit levels in program logic making them invisible to brokers. If you use this mode, the stop loss and take profit orders are not located in the trading server. EmergencyStopDist - second level of protection, when StealthMode is used. At values greater than zero, it activates a second level of true (Emergency) StopLoss on a greater distance than the virtual hidden StopLoss is located. In such case, the value of the new emergency StopLoss will be the sum of the EmergencyStopDist value plus the value of the hidden StopLoss. MinEquity - minimal equity needed for trading. BandPeriod - Bollinger Bands period. BandBreakEntry - breakout in 4-digit pips of the BB line to initiate an opposite trade (the value could be negative). BandBreakExit - breakout in 4-digit pips of the opposite BB line to initiate closing of the existing trade (the value could be negative). UseTrendFilter - change this to "true" if you want to trade only in the direction of the trend defined by the two MAs below. MA_Fast_Period - fast moving average period. MA_Slow_Period - slow moving average period. MA_Trend_TF - timeframe of both MAs. TimeRestriction - by default, this is "true" so the EA will trade only in the hours listed below. If you do not want to use the time filtration, change this parameter to "false". CTHour1 - 6 - six possible slots for trading hours. Values 0 - 23 activate the slot. Enter a large value like 55 to deactivate the slot. Best results from our experience are achieved at 21 and 22 GMT. You absolutely should adapt this hours to your brokers GMT shift. The default values are adapted for GMT +2 (winter time). WednesdaySwapFilter true/false - Wednesday swap filter cancels all trades in Wednesday evening in the direction of the negative swap, if the swap is worse than MaxNegSwapPips parameter. MaxNegSwapPips - minus 0.5 pips seems reasonable threshold. RolloverTimeFilter true/false - switch on/off the rollover time filter. MinutesBefore - minute time interval before midnight, in which all trading operations will be canceled. MinutesAfter - minute time interval after midnight, in which all trading operations will be canceled. x_MaxSpreadFilter - switch on/off the rollover additional spread filter. x_MaxSpread - multiply the initial MaxSpread, which will be allowed in general, before canceling all trading operations. As an example, if the MaxSpread is 6 and x_MaxSpread is 2, all trading operations will be canceled if the spread exceeds 6x2=12 pips. RecoveryMode - activate the drawdown recovery. It works when AutoMM > 0. The full parameter list and additional info are available in Blog. In backtest is excellent!! From tomorrow we will check in real account! Great product, but no news filter. Good Asian, better than some paid products. Установил на 7 валютных пар на Tickmill - толчется в районе 0 уже недели три. Best night EA Ever... Yes, there are some bad period, that is why you have to look at your Money Management.. 0.04 per trade per $1000 is pretty safe, beyond 0.04, is DANGEROUS..
Good EA, but some trades start or end after NY close, when spreads are high. 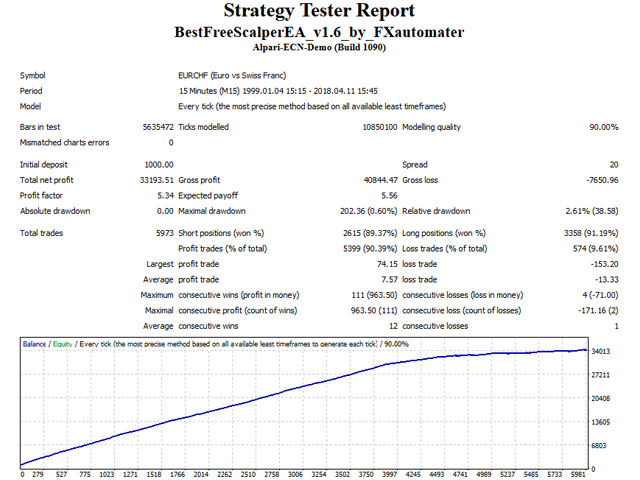 Krastev has better EAs and you should take a look at BF Smart Scalper, which is probably the best free scalper. Everything worked well for 3 to 4 months, and since now 1 month, I lost more than I had won. I still have to thank the author for offering a free EA. This EA is not bad, it only needs to be improved. I was lucky that it works initially, it allowed me to cover the losses that I have for several weeks. But someone who starts using it at the wrong time could lose very large amounts quickly. The EA is not usable in the current state. Above all, it lacks a filter for the news, because it is often because of that that you will lose your money. I tested piles of "night scalper" like this one, and for the moment, paying or free the result is always the same. Yes it is good to trade during low volatility, but the problem is there. This type of EA is sensitive to the slightest change, and at each bad period you will lose all your winnings. I'm not sure if a news filter will fix all the issues. That's the limit of this type of strategy, I think, and that's the reason why nobody gets there. All these EA "night scalpers" have the same problem. I can't recommend more. Many thanks to Lachezar! i use BF scalper on 20 pairs of currencies, many trades winner around 80 % the night, very good product. thank you. Can you please send me the set files for the other pairs? No live signal means it is not working ! Always there is a reason why the EA Seller does not provide a live signal. Thank you Mr Krastev for providing this amazing EA for free, to me is the best EA i ever use. Mr Krastev always replied my questions as if he has earn a lot of money from me. Truth is he he did not even charge me a single cent. Really a generous man with a big heart. I salute to you Mr Krastev. Been using this system along with my other scalper systems since May 2018. Performance on the live account: 12% monthly profit and 15% drawdown with medium risk management. Best Free Scalper as the name suggests! Fast Response! Great EA on test!!! Thank you very much! Muy buenas noches el motivo para escribir es para consultarle ¿cual es el horario que debo utilizar para mi broker HOTForex? muchas gracias por su ayuda. Very good EA thanks a lot. Update: profits and losses are equal. Messed up my risk.. but in one night this thing gave me +20% gain on my account.. real live ecn broker.. nice! negative result after 3 weeks on 8 pairs. (-15€ with 0.01 lot) Tickmill Demo, VPS 15 ms. Very very good!! Many thanks to the author for delivering us completely free. I haven't expected to have such successful results in forex robot that is FREE. Thank you sooooo much!! This robot is free and is the best scalper I`ve ever seen. IF you set it properly it performs better than actual paid scaplers. thx for Share, realy Good Work. I think it is one of the best free EAs on the market. The tests are very promising. Good job Lachezar. Thank you for the free EA. I have tested this expert advisor and I love it. Shows stable and successful results. работает на 8 парах, все в плюсе при открытых ордерах, закрывает в минус, ну как так? Great so far! I use the EA since 1.5. on a live account at IC Markets. I use all eight pairs with the recommended settings. Almost all winners, 10% performance and no noteworthy drawdown. The publisher also quickly answers all questions. I keep testing. Thank you! Mediocre results in forward Demo test. Perfect EA! Developer, thank you for all your support. Very impressive and complete EA, I have been testing it for a while now and I can say that the results (on real account) are very good. Definitely one of the best free EA I have ever seen. From my observations, the broker selection is very important for the proper functioning of the EA. The support from the developer is quick and accurate. I keep testing and will provide further updates on the results. descargado y en pruebas ,de momento todos los SET son muy buenos ,casi demasiado para ser ciertos .